In December 2005, Daniel McGowan was arrested by Federal agents in a nationwide sweep of radical environmentalists involved with the Earth Liberation Front-- a group the FBI has called America's "number one domestic terrorism threat." For years, the ELF--operating in separate anonymous cells without any central leadership--had launched spectacular arsons against dozens of businesses they accused of destroying the environment: timber companies, SUV dealerships, wild horse slaughterhouses, and a $12 million ski lodge at Vail, Colorado. IF A TREE FALLS: A STORY OF THE EARTH LIBERATION FRONT, directed by Marshall Curry (Street Fight), tells the remarkable story of the rise and fall of this ELF cell, by focusing on the transformation and radicalization of one of its members. Part coming-of-age tale, part cops-and-robbers thriller, the film interweaves a vérité chronicle of Daniel on house arrest as he faces life in prison, with a dramatic recounting of the events that led to his involvement with the group. And along the way it asks hard questions about environmentalism, activism, and the way we define terrorism. "If a Tree Falls offers a rare and intimate view, not just into the personal lives of Daniel McGowan and his family as he faces the prospects of a future behind bars, but also into the thoughts, emotions and actions that spearhead the fiery underground struggle to defend the Earth. The film creates a formerly non-existent safe space, where the audience is able to get an honest glimpse into drastically conflicting viewpoints on the issues of environmentalism, terrorism, revolution and repression, and walk away with our own individual opinions, though perhaps better informed. It's a very respectful and fair portrayal of a very polarized and criminally-charged issue, where the subjects' humanness takes center stage." "Its presentation of the issues were incredibly well balanced and thought provoking...The film remained fair and faithful to all the subjects of the film and clearly demonstrated the complexity of the issues. I believe viewing the film would prompt law enforcement personnel and those who exercise civil disobedience to think beyond moments of confrontation and that the film will engender a greater awareness and a better understanding between police and protesters." "Personalizes ELF's history...While the film does question whether authorities overreached in the charges lodged against ELF members--since the group targeted property and never injured anyone--the filmmakers also afford time to law enforcement officials to argue their case, making this a more nuanced than polemical documentary...Recommended." "A cautionary tale...Suitable for high school and for college courses in cultural anthropology, development anthropology, economic anthropology, anthropology of violence, and American studies, as well as general audiences." "Fact-filled...Unbiased...Open-ended questions are posed, such as what is terrorism and isn't big business responsible for oil spills and mountaintop removal mining?...Classes in journalism, political science, and current events can utilize this program as well as literature classes reading Edward Abbey's The Monkey Wrench Gang." "Teachers of modern world history, ethics, environmental science, sociology, law, and other disciplines might find this documentary to be one that provokes strong emotions, important discussion, and close observation. This video does a fine job of presenting the complicated and potentially polarizing issue for a variety of viewpoints...All the stakeholders involved are depicted with depth and compassion...These are real people in real situations wrestling with real ethical issues." "Recommended. In addition to the story of McGowan and ELF, the filmmakers also reveal the extent to which the authorities went to get ELF members to name names and spy on each other in the wake of additional concerns after 9/11, which created new definitions of terrorism and new tools to deal with it. If a Tree Falls, thus deals with civil liberty concerns as well as environmental issues. Winner of multiple awards, this film effectively uses interviews, television and documentary clips, and narration to tell the story of one man in a larger political, historical and environmental context." "A true life outlaw tale, as stirring as it is tragic, the story of the Earth Liberation Front offers a DeLillo-flavored draught of high-proof righteous excitement." "A compelling doc about radical environmentalism...informative, compelling." "It's a wildly successful and engaging documentary." "The vibe alternates between an early Clash concert and a dark, dark twist on Ocean's 11." "The film sweeps us up like a thriller...a fantastic moral ambivalence." "This is a sterling example of journalistic documentary, clearer, fairer and more engrossing than any of the sensationalistic newspaper or magazine stories about the ELF." "An intriguing and important film... As director Marshall Curry said at his Sundance post-screening QandA: 'The film has a point of view, but a grown-up point of view that acknowledges the complexity of the situation.'" "Compelling, adroitly edited portrait of the radical group." "A gripping doc about eco-terrorism." "Power mix of violent confrontation between police and activists, ultimately propels the film into a call for action and change." "Yields a remarkable clarity about the perils of modern idealism." "A powerful and mesmerizing documentary." "5-stars: [The] filmmakers raise questions and stir public debate about the definition of terrorism, especially in the post 9/11 security environment...very compelling." "By turns elegiac, tender, funny and horrifying, it is a portrait of McGowan that doubles as a complex philosophical argument about the benefits and dangers of violent social protest." "If a Tree Falls is nothing if not troubling, complicated and thought-provoking...[the film] provided a common text from which everybody--radical or moderate, liberal or conservative--was able to work, interpret, converse. This common ground paired with the power of narrative establishes a strong ally for the environmental community and a bridge across divided ideologies and hopes." "Engrossing... A classic story of radicalization." "Curry has crafted something complex and worthy of attention, a film that asks hard questions about environmentalism, activism, and the way we define terrorism." "[A] remarkable and moving film...The environmental documentary genre can be ripe for groupthink and complacency, and occasionally I find myself refreshed to see a doc that forces viewers to challenge their own preconceptions and opinions. If a Tree Falls...is one such film." "[The film] compels audience members to think about (or re-think) a number of complex situations and uncomfortable questions... It's a fascinating film." "A fascinating, evenhanded look at the ELF." "A truly fascinating documentary that unravels the complex morality of taking on a cause, this movie is the perfect starting point for what we can only hope is a continuing discussion of how to care for the planet." 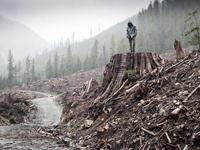 "The gripping documentary If a Tree Falls: A Story of the Earth Liberation Front offers an intimate look at the radical environmental group." "One of the more personal and intimate environmental docs in recent memory...It's a powerful tale; one guaranteed to generate heated discussion." "A stunning look at one of the most fascinating groups of people in the modern world. It pulls no punches, and it provides no easy outs." "Meticulously researched, thought-provoking, balanced and humane new doc...A riveting cat-and-mouse game with revealing comments from felines and rodents alike."